The last news about Johnny Depp's upcoming moving: Sweeney Todd: The Demon Barber of Fleet Street. Watch the trailer. An extended trailer of Sweeney Todd: The Demon Barber of Fleet Street has been released. You'll have a much better understanding of what to expect from Johnny Depp's upcoming movie if you watch it. A musical comedy that looks damned great, can you believe it! Here below the opening credits of Johnny Depp's upcoming movie, Sweeney Todd: The Demon Barber of Fleet Street. That's a quite dark opening! 3 more behind-the-scenes clips of Sweeney Todd: The Demon Barber of Fleet Street have been released. Johnny Depp is incredible: it's definitely a great actor, but still, he looks modest during this iterview! Sweeney Todd: The Demon barber of Fleet Street is an upcoming movie directed by Tim Burton starring Johnny Depp. Johnny Depp's wife is damned lucky! An international trailer has been released for Sweeney Todd: The Demon Barber of Fleet Street. I recommend you to watch the official trailer of Sweeney Todd: they are complementary. Tim Burton has adapted the Stephen Sondheim's musical 'Sweeney Todd: The Demon barber of Fleet Street' which first opened in 1979. The movie is starring Johnny Depp in the role of Sweeney Todd, a crazy soul lost in a vengeance quest. 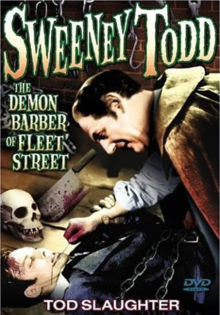 There is an earlier adaptation of Sweeney Todd's story for cinema: a British movie was produced by George King in 1936. This British version has fallen into the public domain. Well the Bristish film is kind of old fashioned nowadays. I bet that Johnny Depp's talent will renew the interest in 'Sweeney Todd: The Demon barber of Fleet Street'.